Book chain Borders is selling its UK and Republic of Ireland stores to private equity group Risk Capital Partners for an initial $20m (£10m). London-based Risk Capital is buying all 42 Borders superstores in the UK and Republic of Ireland, and all 28 branches of sister outlets Books Etc. Risk Capital, led by entrepreneur Luke Johnson, could pay an additional £10m, depending on the stores' performance. However, Borders is not selling its UK Paperchase stationery shops. 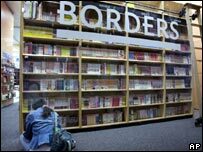 US-based Borders has more than 1,200 stores around the world. "We are excited by the opportunity presented by Borders UK and Ireland," said Mr Johnson. "We intend to build on the strength of the business and this well-respected brand as one of the UK's largest retailers. "Our strategy will focus on improving sales and optimising the store base, while improving margins and inventory management." Risk Capital's other investments include fashion retailer East and restaurant chain Giraffe. A former boss of Pizza Express, Mr Johnson is chairman of Channel Four.